The Metabolism Lab, University of the Punjab organized “Craft of Scientific Writing – A Two Day Intensive Workshop on Scientific Writing and Publishing” on 15thMarch, 2018 in collaboration with Department of Microbiology and Molecular Genetics. Workshop was designed to assist in the development of the skills that are required to write and submit the manuscripts. Workshop was a combination of formal presentations, engaging the participants in peer-reviewing and providing them feedback on their writing samples. Key organizers of the workshop were Prof. Dr. Anjum Nasim Sabri (Chairperson of Department of Microbiology and Molecular Genetics), Dr. Nousheen Zehra Zaidi-Associate Professor and Dr. Yasir Rehman- Assistant Professor. Instructors shared their valuable knowledge in workshop on, principals of effective writing, cutting the clutter, Grammar tips, effective punctuation, efficient paragraph and sentence structure, working components of a scientific manuscript, selecting target journal, meeting journal requirement and dealing with the comments of the referees and editor. Participants (researchers) performed a range of writing and editing exercises to improve their writing skills. 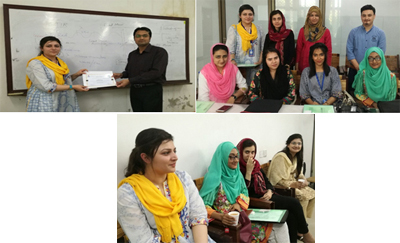 At the end of workshop, Chairperson of Department of Microbiology and Molecular Genetics, Prof. Dr. Anjum Nasim Sabri shared her insightful views and distributed certificates to the speakers and participants.